Comfort and convenience go hand in hand at Courtyard Atlanta Buford Mall of Georgia. Complete with a central location, our hotel provides easy access to Infinite Energy Center, Mall of Georgia and Gwinnett County Airport. Traveling wedding guests will appreciate how close we are to various venues including Buford Community Center Town Park & Theatre, Bradford House & Gardens, Ashton Gardens-Atlanta and Rock Springs Farm. After an eventful day, retire to our rooms and suites where pillowtop beds, lush linens and fluffy pillows await your arrival. Designed to meet your high-tech lifestyle, our rooms and suites offer complimentary high-speed Wi-Fi and flat-panel TVs. 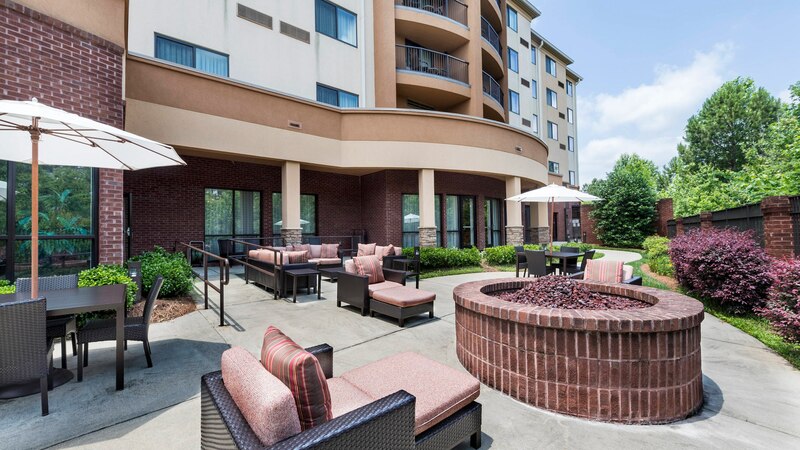 Experience a refreshing stay at Fairfield Inn & Suites Atlanta Buford/Mall of Georgia. With easy access to Sugar Hill Amphitheatre, Infinite Energy Center and Coolray Field, our hotel puts the best entertainment within your reach. After a busy day, retreat to our modern rooms and suites, offering more space than traditional rooms in the area. Stay as relaxed or productive as your please with our free Wi-Fi, ergonomic workspaces, plush bedding, mini-refrigerators and microwaves. In the morning, fuel up with our complimentary breakfast buffet, then head to our indoor pool or fitness center featuring cardio machines with built-in TVs and free weights for a brisk, but powerful workout session.